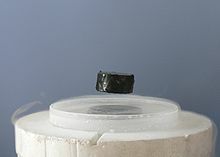 A magnet levitatin abuin a heich-temperature superconductor, cuiled wi liquid nitrogen. Perseestent electric current flaws on the surface o the superconductor, actin tae exclude the magnetic field o the magnet (Faraday's law o induction). This current effectively forms an electromagnet that repels the magnet. Superconductivity is a phenomenon o exactly zero electrical reseestance an expulsion o magnetic flux fields occurrin in certain materials, cried superconductors, whan cuiled ablo a chairacteristic creetical temperatur. This page wis last eeditit on 3 August 2017, at 00:52.